The UN19F4000 is as small as it gets for Samsung LED TVs in 2013/14. The 19 inch size isn't seen too often, but can come in handy in the right situation. A small TV for the kitchen, office, dorm room or even a camper can be hard to find. This little 720p LED TV fits the bill when it comes to physical size and weight. The width is only 17.9 inches across and it weighs less than 6 pounds with the stand attached. There isn't much to talk about when it comes to feautres on this one. It's pretty bare. The strong LED backlighting is one plus that will really help with the brightness and overall picture quality, especially on a screen this small. Some see the 720p spec and immediately move along. It's understandable to want the best in a TV, but 1080p at this size is going to be very hard to notice. Using the TV as a computer monitor is going to be the only place where full HD really makes a difference at a size this small. Most over-the-air broadcasts and cable programming are still in 720p or 1080i. Even a good number of video games rank in at 720p. So you will really be using the UN19F4000 to its full potential. When you think about the price it goes for it really makes sense. The 60Hz refresh rate seems a little low, but it surely keeps the cost down on this one. Motion blur and judder are not going to be highly noticeable on a 32-inch screen this size as well. Those who are looking may be able to see some, but you have to really be looking. The LED backlighting really makes the picture quality pop on the UN19F4000. Overall viewing quality is enhanced due to the light throughput although the picture is much dimmer than some of the larger top end LED TVs in Samsung's lineup. Color is an area in which this backlight can have some difficulty. Saturation doesn'really compare. The backlight can wash them out so we recommend a toned down backlight setting which can be found in the picture controls menu. Side viewing angles on the UN19F4000 are certainly not as bad as some TVs have been in the past. Contrast and color begin to degrade at about the 30 degree mark. This is typical for LCD/LED TVs and this one is not plagued by terrible viewing angles. The F4000 looks similar to the F5000 and F5500 above it in the lineup. For a budget model like this one, the look isn't bad at all. 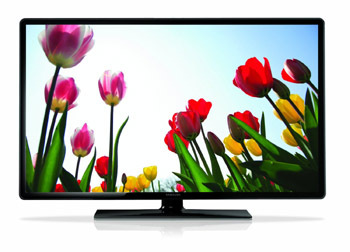 Glossy black plastic bezels measure in at .75 inches thin to give the TV an updated appearance. The square stand is nothing new, but doesn't hold the TV back. The stand is the same black plastic as the bezel. The corners are rounded out instead of having a squre appearance. It's nice to see the low end TVs looking so good.